In astronomy, a conjunction happens when two or more celestial objects come within close proximity in the sky. Note this is just how it appears to the eye — the objects can be separated by light years in actual distance, but on the 2D dome of the sky they can still appear closely spaced. Technically, a conjunction occurs when two celestial objects have the same right ascension (the east-west coordinate used for mapping the sky). Stars never change their coordinates, but the planets do so continuously. They drift slowly east or west relative to the fixed stars. The moment of closest approach between a planet and star (or another planet) is on a specific date at a precise time, but planetary motion is gradual and the two will remain visually close for a few days. The Moon moves much more quickly through the sky, so when it participates in a conjunction it’s only there for one evening. On November 2, we’ll enjoy a quadruple conjunction. Actually, a quintuple if you want to let Antares in on the party. The five objects could be enclosed by a 15° circle. That’s not as close as some conjunctions, but it’s definitely worth a look — all the objects will be bright and easy to spot. They will, however, be fairly low in the sky and set within 2 hours of sunset. Obviously, you’ll need a clear view of the southwest horizon. Sabik is a bluish-white magnitude +2.43 star in the constellation Ophiuchus, and the 86th brightest star in the sky. It’s actually a binary star, but you’ll only see a single point of light with your eyes. Its formal designation is Eta Ophiuchi (abbreviated η Oph). Sabik is 88 light years from Earth. The crescent Moon (5% illuminated) should show some nice earthshine. If you can find the Moon, you should easily locate the other objects participating in this meetup. Saturn is now receding from Earth, at a current distance of 1.3 billion km (800 million miles). It shines at magnitude +0.5 with a “strawish” color. If you have a telescope (and maybe with good binoculars) you’ll be able to see its rings. The ring system reached maximum tilt in its 30-year cycle earlier this year. 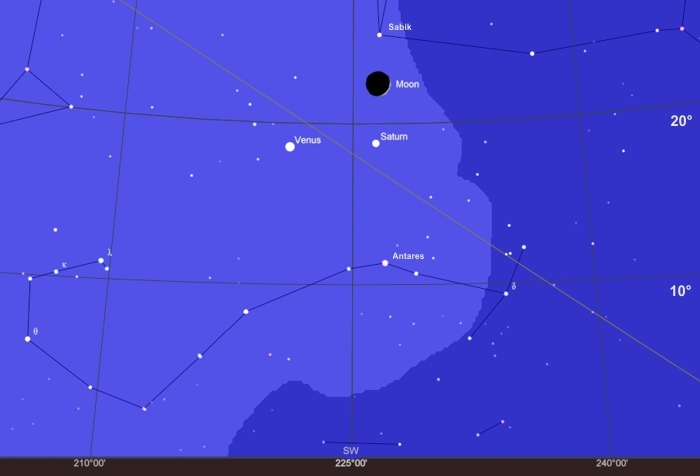 Venus will be the brightest object (after the Moon), shining at magnitude -4.0. Through a telescope (or good binoculars) you should see that it shows a crescent phase much like the Moon. Antares is a reddish star in the constellation Scorpius. At magnitude +1.1 it’s the 16th brightest star in the sky. In folklore, it’s the “heart” of the scorpion. Its formal designation is Alpha Scorpii (abbreviated α Sco). Antares is 605 light years from Earth. You might wonder how we can call this a “conjunction” when the participating objects are not arranged in a straight line. They should line up exactly if they have the same right ascension. Turns out that astronomers use the term more casually. Whether it counts as a conjunction or not depends on how small a circle will enclose the objects of interest. There are “good” conjunctions and “mediocre” conjunctions. And there’s no official standards. Allow me to provide some scale. The Moon can be enclosed by a circle just 0.5° in diameter. For comparison, this 5-object conjunction could be enclosed by a circle 15° in diameter. Is that a “good” conjunction? It is for me, but that’s just my subjective appraisal. It’s all about visual impact: geometric patterns like the near-perfect right triangle formed by Sabik–Saturn–Venus, the brightness of the objects, and even the terrestrial landscape below. Other astronomers have their own criteria for “good” conjunctions.